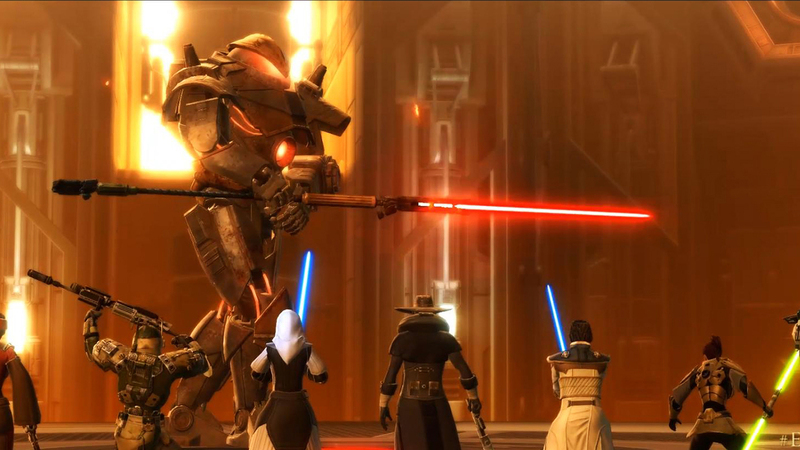 Celebrate with a new Astromech Droid, Double XP, #SWTORPrime promotion and more! Thank you for your epic support! Celebrate Star Wars™ Day with the battle-hardened M4-Y6 Astromech Droid by your side. Log in to play by May 8th to qualify! Having survived even the harshest environments, the M4-Y6 Astromech Droid Mini-Pet has faced countless adversities and come through the other side. Well-traveled and ever-reliable, this M4-Y6 Droid Mini-Pet carries every mark of his adventures and is always up for another challenge! 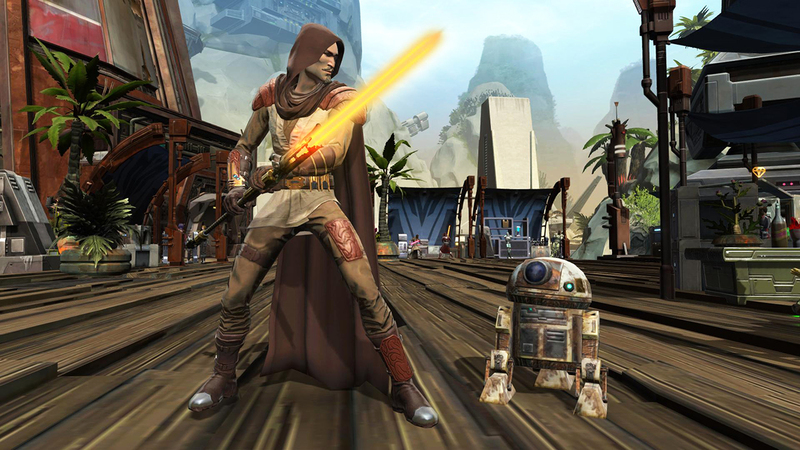 The M4-Y6 Droid will be delivered via in-game mail within 24 hours after the promotional period ends. Get the ‘Eternal Throne Ultimate Pack’ with Twitch Prime! Get all nine chapters of the latest Star Wars™: The Old Republic™- Knights of the Eternal Throne expansion and face one of the most powerful families in Star Wars™. Jump right into the action with an Outlander Character Token and become a Level 65 Outlander, a veteran of the Great Galactic War. 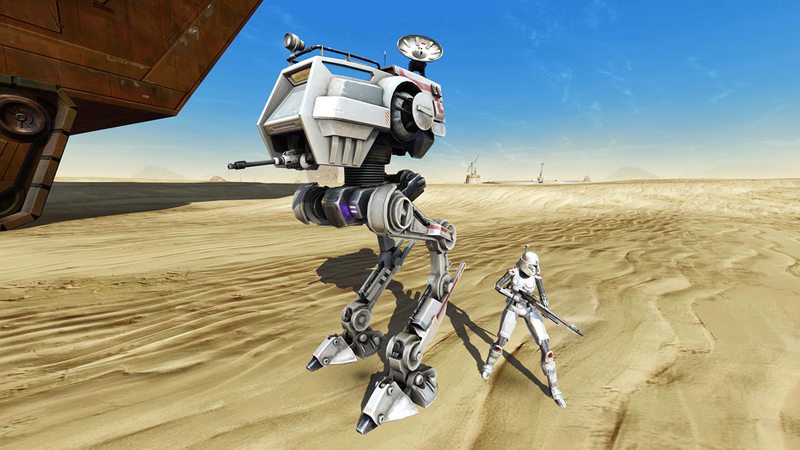 Intimidate your enemies inside your own AC-PT (Alliance Combat Patrol Transport) Walker Mount and tower over enemies as you traverse dangerous terrains across the galaxy. Terms and conditions apply. See www.swtor.com/twitch-prime for details. Jumpstart your Star Wars adventure! Earn double character and legacy experience now. Now’s your chance to own some of the most iconic items in the in-game market! To visit the in-game Cartel Market, click the gold Cartel Coin icon () on your top menu bar, then select ‘CARTEL MARKET’ from the dropdown menu. Increase experience gained from all sources by 25% for 3 hours! 360 Cartel Coins Now 100 Cartel Coins! Adventure as a passionate warrior species! 600 Cartel Coins Now 450 Cartel Coins! Channel your dark side in this ultimate battle armor! 1440 Cartel Coins Now 450 Cartel Coins! Join the ranks of an ancient hunter species! Traverse the galaxy on this iconic Tauntaun! 2200 Cartel Coins Now 450 Cartel Coins! Fight alongside your own fiery Ewok! 2100 Cartel Coins Now 450 Cartel Coins! Get behind the wheels of this sleek Podracer!